I have seen a very cold winter season here in my place. It was so cold, so dull and very lazy winter. But i dont want maha skin to be affected. Because during the first week, i didn't take any steps for winter and i just thought it will pass by. But it was later i realized that maha's legs and hands are getting so drier. That when it hit my head. So below are the little things which i did to care my baby on cold winter. Check out, How to take care of baby skin in summer too.. I bathed maha once in two days. And also it is not a very long bath. Because i dont want her to catch cold. I also made sure she bathe in warm water. Before bathing i make sure i apply coconut oil all over her body. I also make sure to put on the baby lotion all over her as soon as she comes out of the shower, so it seals the moisture in her skin. I do a quick massage three to four times a day. I apply coconut oil on her hair really well before each bathing and shampoo her hair after that. So her hair stays soft and moisturized and doesn't get dry. I used to apply very little few drops of coconut oil on her hair in the evening so it prevents the dryness. Make sure you apply baby lip care gel on the baby lips if it gets too dry, and applying petroleum jelly in your baby nose prevents the dryness inside the nose which may cause discomfort in some babies. Maha didn't get these problems. I think feeding water throughout the day helps. Make sure your baby wear a hat or hood whenever you take her out. So no cold air gets in her ears and head. Babies head should be always warm. Wear soft cloth dresses for baby and make sure you have a jherkin of a sweater after that. Never wear woolen clothes directly over the baby skin. It may cause rashes. I make sure to feed her things which keep her warm. Lots of soups with vegetables is important. I never give fruits in winter as it may cause cold. Maha is looking so cute... I am a big fan of your blog.... I have 8 month baby. I give my Lil daughter every food from your menus only. Thank you for this wonderful blog which helps me a lot..
Hi am malathi, I am so glad to tell u that, u r really a good mum to all.I have checked all your recipes, it's so good to see that,my baby is 9month,he looks good for me, but my hubby relatives always commenting his color and body weight,it's really felts so bad for me, now I can't tolerate their words throwned daily to him,so I decided to ask all mum's help,only mum's no the value of baby not even any husband,so pls help me by giving some valuable tips for increasing the tone of my boy Sai Sarwesh,his leg color alone too black,so they are hurting me a lot by commenting that,which soap,cream,juice,food,veggies for increasing the color some Wat. As a mom and as a follower of ayurveda, I'm giving you few tips/suggestions which you can follow for your baby. Hope you don't mind.
. Coconut oil is very cooling to the body. Hence its better you don't use coconut oil to massage your baby during winter. Use in summer. For winter, use warm sesame oil. Also don't massage when your baby has cold/fever. Massaging once a day, 15mins before bath is enough. Too much oil massage will clog the channels which is not good even for adults.
. To prevent dryness, use a humidifier at home which will prevent drying nose. Try to avoid petroleum jelly.
. For her lips, you can apply little melted ghee. This will keep her lips soft, pink and prevents drying. Try to avoid lip balms/gels.
. You don't have to avoid fruits during winter. Instead, give stewed apples, pears with a clove. Boil apple or pear with a clove until the fruit turns soft. Serve it warm to your baby. 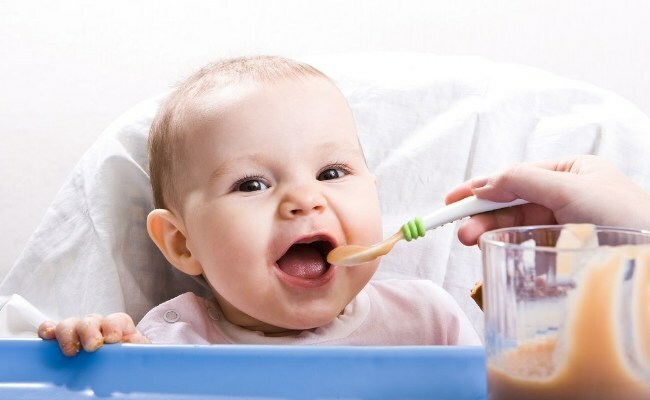 (You can grind the stewed fruit if your baby prefers pureed food).
. Not just during winter, even during other seasons, for babies, its better to give stewed fruits(apple or pear with few strawberries or blueberries) with cinnamon or clove. It helps in better digestion and will not cause gas/ bloating/constipation to the baby. Don't worry about the nutrition in cooked fruits. Your baby will get the necessary nutrition from the fruit. The below suggestion is a reply to "Karthika's" comment. The large bananas are channel-clogging. Instead you can give small bananas rarely. Too much bananas are not good for babies. It will cause mucous and one day lead to severe chest congestion and cold. Also banana in the morning is definitely not a good idea to give to babies. Stewed apple or pear with a clove is better which will not cause mucous and keeps the baby nourished and happy throughout the day. Thanks for the post, it is really healpful. But if anyone want to buy baby care products online, can visit the online shopping portal; awesome bazar. During season change our baby is likely to suffering from different kinds of flu due to infection and other issues. But as a parent, we have to take very good care of our baby's health. Mostly cold and flu infection is the main attraction during winters, so it is really essential to put warm clothes and other essential winter items with us to provide our baby better care. Baby skin conditioning lotions- These are the lotions that you can gently massage into your baby's skin to nourish and moisturize it, conditioning the tender skin of the baby. awesome Baby Wear i like all. please tell me how get one for my boy.